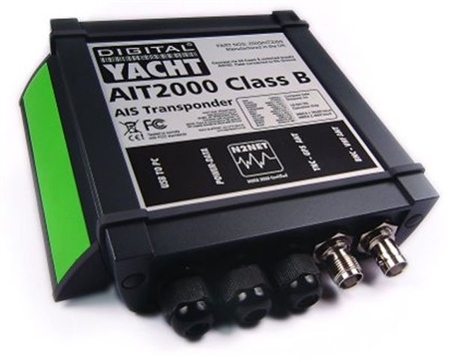 The AIT2000 uses the latest AIS Transponder technology to squeeze more performance and interfacing options into a housing that is half the size of our previous generation transponder. This ultra-compact Class B Transponder has three outputs; NMEA 0183, NMEA 2000 and USB connection, allowing it to work with every AIS compatible chart plotter or software package on the market today. Featuring a remote silence button option, two NMEA 0183 Inputs and Outputs, four status LEDs and rugged vibration-proof mounting brackets, the AIT2000 is the third generation of Digital Yacht AIS transponder and replaces the very popular AIT1000. The configuration of your vessel's fixed data, such as MMSI, call sign, boat name, dimensions etc. is made easy with the included Windows and Mac compatible proAIS2 software. Once configured, the unit will provide AIS data to a PC or Mac running suitable navigation software or a dedicated chart plotter, such as the latest Garmin, Raymarine, Navico, Standard Horizon and Furuno units. As well as transmitting your own vessel's position so that other AIS equipped vessels know where you are, the AIT2000, when connected to an existing VHF antenna (via a splitter) or dedicated AIS antenna, will receive all AIS targets within range of your boat, typically up to 30NM With two industry standard NMEA 0183 outputs, our own N2Net connector for plugging in to an NMEA 2000 network and a simple plug and play USB connection to a PC, the AIT2000 is the perfect AIS transponder solution for all light marine vessels up to 300 tons. * Except for the US where dealer programming required. AIS target range, like VHF, the range is dependent upon a number of installation factors such as; antenna gain, antenna height and size of ground plane. Ranges in excess of 20 miles should be possible if all of these factors are perfect.